a spoonful of dish features this sweet bicycle print that definitely has words to live by. I just love the idea here! keep collected is rocking the look I am totally coveting for spring - a maxi dress with lots of layers! Check out her look for inspiration! thought and musing is totally killing this sequin-by-day look. I absolutely love it when tops can pull double duty like this. jewelscapes brilliantly pairs bright blue with turquoise accessories. I just love these two colors together, it reminds me of the beach! good tots tracked down the most precious wood and fabric handmade toys on etsy. If you have a friend that is expecting a baby you just have to give some of these as a gift, what a great keepsake! 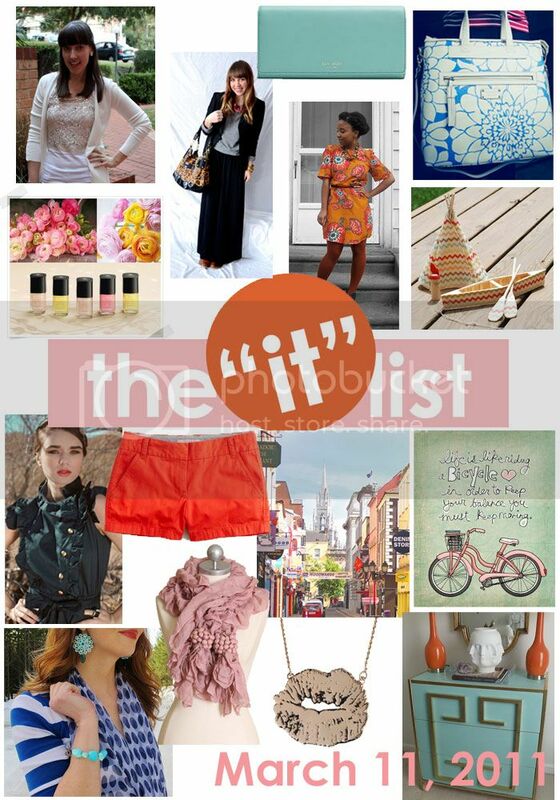 the it list is produce by jill of good life for less for more information on how you can be involved, click here! Wow, thanks for the great giveaway heads ups!! !